Getting picture in powerpoint is simple trick, maybe all of you can do it. The question is why we take or save picture from powerpoint? That many reason, for me maybe the powerpoint have good background and need to use it on the other powerpoint. Or maybe, I will use It and give animation touch so it’s can make my powerpoint interesting. This is the easy way. 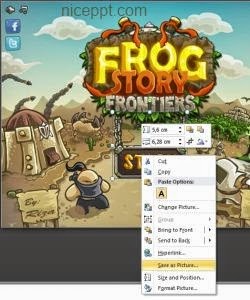 If you want to get picture from powerpoint, you can use right click on your mouse and then choose save as. First think you should do is, click in on the picture first and continue with right click. Another option is, use print screen key on the keyboard. But the lack of using this technique is you will get all picture from screen, so you need to crop it before use it. But, this method is the simplest because you only need to push one button from keyboard. If you need capturing picture for high speed, use this technique. The other way to get picture from powerpoint is, use the snipping tools. Choose snipping tool for your program, and then choose snipping tools. 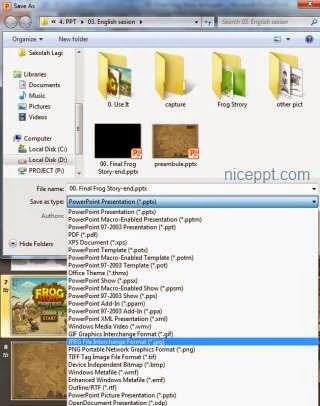 Using snipping tools is not only for powerpoint but also you can use for another program. I usually use snipping tool if I want to capture picture from pdf or and protected document. Its easy because you can get precision picture because you chose the area by your self. The other think that we can use as the way for saving picture from powerpoint is using powerpoint itself. It’s pretty simple, you just save as on powerpoint with format picture (Jpeg, png, gif etc). What we use this technique? Usually I use this technique for preparing background. What I mean is, sometimes I use may picture that I combine in one sheet. But because there so many picture, so it's too risky if I use it for other sheet. And to make it simple, I just make that sheet as picture, and I upload it as background for powerpoint. That is several way to get picture from powerpoint, I hope it can be useful as reference for you while using powerpoint.